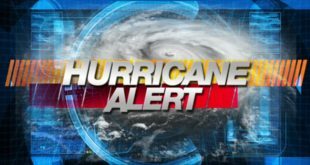 Hurricane Matthew’s second wave has thousands of locals, who have never experienced a flood, fleeing their homes as waters engulf area towns. 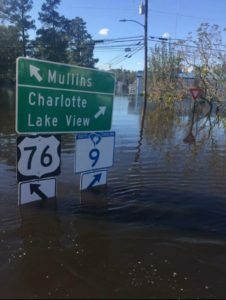 The entire town of Nichols, S.C. is completely underwater. 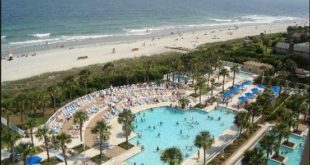 These are the very towns tourists drive through to reach the beaches of Myrtle Beach, S.C. Many of these homeowners work in tourist related industries making just over $20,000 annually. Few of these workers have ever asked for any type of federal or state assistance, including unemployment. Most had only a few hours to flee their homes. Two hundred were recently evacuated by helicopter. Thousands of area homes, like those shown in the video above, are now under water. Many of these families will not qualify for federal assistance if they do ask. They do not have flood insurance. Flooding in low lying areas are the main concern in most Hurricanes. 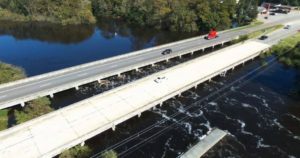 Matthew’s second wave even puts the Gallivants Ferry bridge at Highway 501 at risk. This is certainly not our last hurricane. It is time that Horry County stepped up and worked to build a higher bridge at that location. Georgetown, Mt. Pleasant and Charleston all have great bridges that are well above flood stage. The Gallivants Ferry Bridge is proving that it is not safe when the next Hurricane arrives. Should the bridges at 917, Highway 9 and Highway 378 all go out at once, there will be no direct route from the west into Horry County. 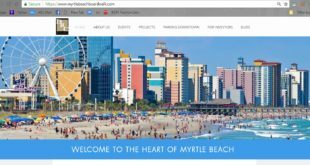 When we reached out to leaders at the Myrtle Beach Area Chamber of Commerce, we got no reply. However, ongoing promotions by MBACC for the need to build I-73 continue. SHOULD THE TOURIST TAX BE AUDITED, PUT BEFORE A VOTER REFERENDUM?